John E. Winters, an effective trial lawyer with over 23 years of experience, focuses his practice in the areas of Labor and Employment and Commercial Litigation. His vast knowledge and experience coupled with a common sense approach to resolving disputes is vital to helping his clients save not only money but also valuable time away from their businesses. He takes the time to understand his clients' needs and legal goals and looks for cost-effective solutions that will get them the results they want. For those cases that require court action, Mr. Winters has extensive trial experience. 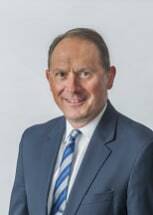 He has served as lead counsel in approximately 50 jury trials throughout Tennessee, and represented clients in cases filed in Ohio, South Carolina, Kentucky, Florida, Indiana and West Virginia. He has also served as lead counsel in many non-jury, arbitrations and administrative hearings. The Best Lawyers in America, a highly regarded peer-review publication, first selected Mr. Winters for inclusion to its list in 2011 for Labor and Employment and Insurance Law. He has received this distinction every year since. Mid-South Super Lawyers recognized Mr. Winters in the field of Civil Litigation - Defense in 2014 and 2015. Martindale Hubbell has awarded Mr. Winters an AV Rating. In his Commercial Litigation practice, he represents companies as well as individuals in federal and state courts and arbitration proceedings. Mr. Winters was selected by the United States Sixth Circuit Court of Appeals in 2014 to serve as a member of the Merit Selection Panel for the Eastern District of Tennessee. In this position, Mr. Winters played a role in the selection of two Bankruptcy Court judges for the Eastern District of Tennessee. Mr. Winters obtained dismissal of his client, a large financial institution, in a case in which its broker was alleged to have been negligent regarding a life insurance policy valued at $1 million. He obtained a Preliminary Injunction for a large financial institution, which barred a former broker from contacting former clients. He obtained dismissal of a case filed by a former medical school student, who claimed that he had been discriminated against due to an alleged disability. He was lead trial counsel in a jury trial for an aviation company that purchased an airplane relying on misrepresentations made by the agent during the negotiations. He was successful at obtaining a verdict against the seller of the airplane. He negotiated resolution of a non-compete agreement for a former employee that allowed the employee to remain employed in the same field. Mr. Winters was on the firm's defense team that successfully defended a putative class action with 17 named plaintiffs in a Title VII claim. The claims of all 17 plaintiffs were either dismissed on summary judgment or voluntarily dismissed with prejudice in exchange for a waiver of court costs after summary judgment was filed. He was also on the firm's defense team that defended a putative class action involving failure to hire issues with a proposed class of over 300 members. In this case, the plaintiffs' motion to certify the class was denied, and two of the individual claims were dismissed on summary judgment. On the one claim that survived summary judgment, he served as the lead trial counsel. The jury returned a verdict in favor of his client. He represented a company that obtained a $920,000 jury verdict against a competitor for engaging in interference with contractual relations, interference with business relations, unfair competition, breach of fiduciary duty and conspiracy. This verdict was later affirmed by the Tennessee Court of Appeals.